The enrolment figures in the six State-owned Technical Colleges and three Vocational Centres have tremendously increased as a result of the State Employment and Expenditure for Result (SEEFOR) intervention and support to the institutions. The Project Coordinator, Delta SEEFOR Project, Mr. Frank Apokwu who stated this recently in Asaba during the World Bank Support Mission visit to the state, disclosed that the enrolment figure improved from 678 in 2016/2017 to 777 in 2017/2018. While saying that a total of 733 SEEFOR beneficiaries have been in Technical Colleges and Vocational Centres across the state, 328 beneficiaries passed the screening examination and presented with starter-packs as soon as arrangements had been concluded. He said that part of measures to facilitate the accreditation of the trades courses in the three Vocational Centers, 28 officials of the state government were sponsored for training by SEEFOR Project as Assessors by the National Board for Technical Education (NBTE) in Lagos. The Project Coordinator recalled that through the efforts of the SEEFOR project, over 35 courses in the six Technical Colleges had been accredited since 2017 and called on stakeholders in the TVET institution to brace up to the challenges of articulating strategies of boosting internally Generated Revenue(IGR) in the institutions for the sake of sustainability. Mr. Apokwu also maintained that a total of Five Hundred and Ninety Seven Million Naira(N597,000,000) had been disbursed to communities under the Community-Driven Development Social project as grants, noting that 71 Community Development Plans(CDPs) had been approved with several of the micro-projects already completed and in use. 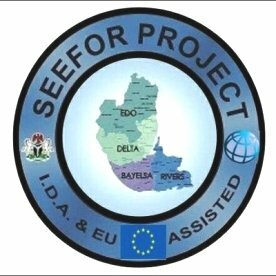 The SEEFOR Project Coordinator said that 18 rural infrastructures had been completed under the FADAMA III Project, adding that according to Agricultural Production Survey conducted by Delta FADAMA SFCO in 2017, there have been remarkable increases in yield of fish production by 86% with plantain farming at 200% while poultry farming was pegged at 83%. Speaking further, Mr. Apokwu said that through the SEEFOR intervention, the new Budget Codes and Charts of Accounts had been adopted for use by the Ministries of Economic Planning and Finance as well as the Office of the Accountant-General, saying that the initiative lead to the preparation of the 2018 Budget and 2017 appropriation accounts using the new codes. He reiterated that bills on Public Financial Management and Audit had been cleared by the State Executive Council, disclosing that they had already been approved by the State Governor, Senator Ifeanyi Okowa for transmittal to the Delta State House of Assembly, even as he said that the final draft of the Delta State Internal Revenue Harmonization and Administration bill was ready for EXCO consideration.